Definition: Sweating, also known as Perspiration, is a bodily function that helps regulate our body temperature. Two types of sweat glands can be found in humans: eccrine glands and apocrine glands. The eccrine sweat glands are distributed over much of the body. Not sweating enough and sweating too much can both cause problems. The absence of sweat can be dangerous because our risk of overheating increases. Excessive sweating may be more psychologically damaging than physically damaging. Sweating Facts: Sweat, also known as perspiration, is a normal and healthy bodily function and it starts to occur just a few months after birth. We mainly sweat to cool our bodies down, a process called thermoregulation. Our brain sends a signal to over 3 million glands in our body to release sweat (a clear fluid made of water, salts, and proteins). As this fluid evaporates from our skin, it lowers our body temperature. 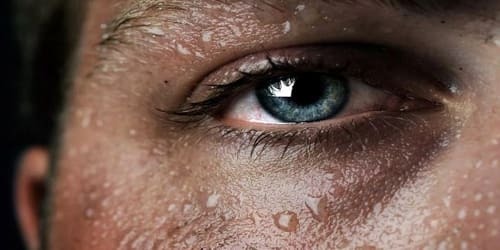 Sweat is our body’s way of cooling us down – When our body starts to sense that it’s overheating, it starts sweating as a way to control its temperature. Our sweat is mostly composed of water –What our sweat is composed of depends on which gland the sweat is coming out of. There are many different types of glands on the human body, but generally, only two main ones are recognized: Eccrine glands and Apocrine glands. Pure sweat is actually odorless – People may notice the smell mostly comes from their pits (hence why they put deodorant there). This is because the apocrine glands produce the bacteria that break down their sweat into “scented” fatty acids. Spicy foods can stimulate our sweat glands – Spicy foods that contain capsaicin trick our brain into thinking that our body temperature is increasing. Spicy food isn’t the only thing we eat or drink that can make us sweat, either. Food allergies and intolerances are often the cause of sweating while eating. Different factors trigger the two glands to react – Besides just cooling down; there are many reasons why our body starts producing sweat. The nervous system controls sweat related to exercise and body temperature. It triggers the eccrine glands to sweat. Emotional sweat, which comes from the apocrine glands, is a bit different. Foods like garlic, onions, or cabbage may worsen body odor – On top of stimulating sweat, foods can also affect how we smell when we sweat. High levels of sulfur in foods like garlic and onions can cause this. A diet high in cruciferous vegetables — like cabbage, broccoli, and Brussel sprouts — may also change our body odor thanks to the sulfur they contain as well. Drinking alcohol may trick our body into thinking people are working out – Another thing that can increase sweating is consuming large amounts of alcohol. Haimovic explains that alcohol can speed up our heart rate and dilate blood vessels, which also occurs during physical activity. This reaction, in turn, tricks our body into thinking it needs to cool itself down by sweating.